saxophone, clarinet, flute, trumpet, and more. 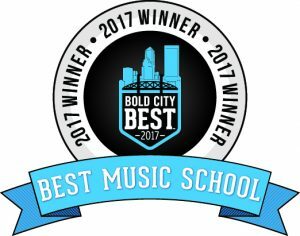 We're proud to have been voted "Best Music School" in the Florida Times Union and Jacksonville.com 2017 Bold City Best Competition. There's definitely a reason why we were voted the best. Serving Jacksonville, Jacksonville Beach, Ponte Vedra, and surrounding areas, Morris Music Academy is dedicated to providing the best possible music lesson experience in an environment that encourages creativity and excellence. We also offer easy access and flexible hours to accommodate today’s busy families. Study a variety of styles. From classical and jazz, to pop, rock and R&B...we've got you covered. Join us today and develop a life-long passion for music! Whether you are looking for lessons on piano, guitar, voice, violin, brass, woodwinds, or just about any other band or orchestra instrument, we're the right studio for you! Our music lesson programs provide a fun, affordable, and comprehensive solution for your music education needs. You'll be in great hands as our instructors are some of the most highly regarded music educators and musicians in the business. Define measurable goals, keep up with your assignments and track progress with your Morris Music Academy lesson diary. Sure you'll learn songs and have a good time. But you'll also learn the fundamentals with which to build a lifetime of musical enjoyment. Even if you don't live in the Jacksonville area, Skype makes it easy to connect to the best private music lessons! Take private lessons in piano, voice, guitar, violin, trumpet, saxophone, and much more from your desktop, laptop, or mobile device using the Skype app. Your connection to Morris Music Academy is always just a click away! "For the first time ever I am taking her to an activity she's not throwing a fit about doing. If you have an opportunity to get in on the roster take it while you can, the slots fill up fast for all the talented and award winning staff at this academy." Here are just a few of the benefits of taking private music lessons at Morris Music Academy. A wide range of instrument options are available to you, including: voice, piano, violin, guitar, bass, saxophone, clarinet, flute, trumpet lessons, and more. Private and small group. We offer a wide range of scheduling options to accommodate your busy schedule. Weekday morning, afternoon, evening, and Saturday morning options are available. Lessons for children as young as three and adults as old as...well, the sky is the limit. It is rarely too early and never too late for music lessons. Simply put, our music instructors are amongst the top performers and degreed music educators in the business. Their decades of experience and training are at your disposal. You won't find any contracts here. All of our music lesson programs are month-to-month with no long-term commitment. Switch instruments or stop at any time. We realize the importance of you enjoying your music lessons. Learn the styles and songs you want to learn or prep for auditions or performances. Experience the benefit of studying with some of the best and most experienced musicians and music educators Jacksonville, FL has to offer. Serving Jacksonville, Jacksonville Beach, Ponte Vedra and surrounding areas. All lessons are month-to-month with no contract.